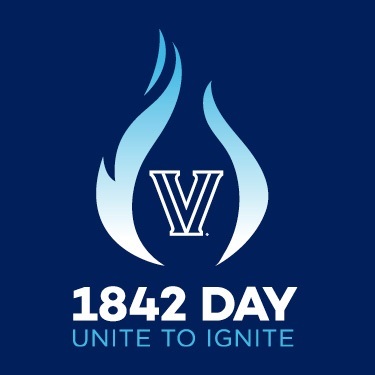 Falvey Memorial Library :: Thank You 1842 Day Donors! Thank You 1842 Day Donors! Generating excitement for the event was NBC10 Philadelphia and Villanova alumnus, Keith Jones, who live-streamed a whistle-stop tour of campus over the course of two days. Jones stopped by the library on Wednesday – admitting that he had not visited here since his graduation in 2007. Entering through the Old Falvey entrance and winding his way through the campus’ most popular quiet study area – the Dugan Polk Family Reading Room – he lowered his voice for the mic and marveled at vaulted ceilings and amazing lighting while continuing to live-stream. His video team panned the camera around the room, stopping at da Cortona’ s “Triumph of David,” the room’s central masterpiece, while Jones spoke softly of its restoration history. The room was packed with students at the time, many of whom glanced up from their work and grinned at Jones’ appearance. Jones followed up his visit with a tweet later in the day exclaiming that the library is “beautiful and a must see!” Thanks, Keith! The Dugan Polk Family Reading Room. Photo courtesy of William Repetto. All gifts made to the library during 1842 Day will be used to enhance our collections, which will benefit users of the library for generations to come. The library must constantly expand its print, electronic and audiovisual collections to meet, maintain and support the ever-changing learning and research activities for students and faculty of the Villanova community. Article by Joanne Quinn, Director of Communication & Marketing at Falvey Memorial Library.